The Klargester Treatment Plant Solution! Unless your site assessment can totally justify the use of a septic tank, planning authorities are likely to require the use of a packaged waste water treatment plant. 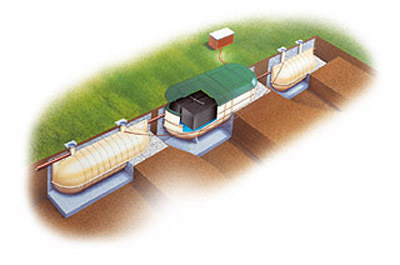 Sewage treatment plants take the basic science of Septic Tanks but are able to accelerate the natural treatment processes to produce higher quality effluent standards in order to meet strict Consent to Discharge standards. 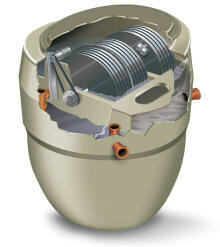 Klargester have been designing, manufacturing and refining the technology of treatment plants for over 30 years. Our range is designed for a wide range of applications, from a single domestic house to housing developments and then on to cater for all sizes of business and leisure facilities. To find out how to further enhance the quality of effluent migrating into a watercourse look at the reed beds section. 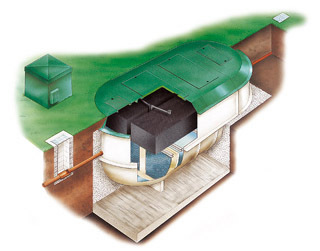 Klargester BioDisc is Klargester’s premier sewage treatment plant and offers a high performance, low maintenance system producing effluent which meets the rigorous quality standards demanded by the Environmental Agency. 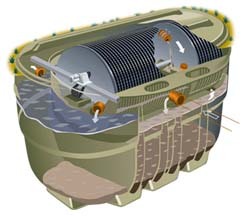 It is the only domestic treatment plant using a Rotating Biological Contactor (RBC). Operating costs are minimal, with an extremely quiet and reliable low power electric motor. Biodisc uses rotating discs as a medium for supporting bacteria which carry out the aerobic treatment process. 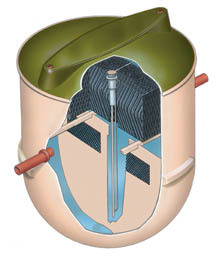 Primary and final settlement are contained within the unit which also has a totally unique flow management system to provide optimum performance under all circumstances. The 2000 Building Regulations require that soakaway overload be avoided. BioDisc flow management uniquely achieves this. 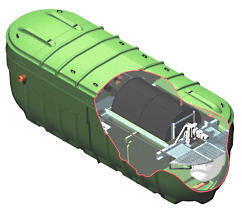 The Klargester AirFlow range of packaged sewage treatment plant is available as standard or high level nitrification plants. They employ a development of the well proven aerobic biological process for the purification of sewage and waste water. Suitable for individual properties with maximum of 6 full time occupants. Suitable for individual houses,small developments and small office schemes.